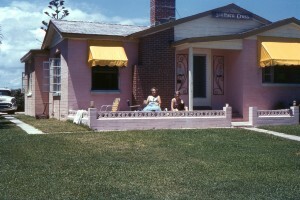 In 1958 we find a pink house made of bricks and yellow sun shades over the windows. Two bathing beauties are out front enjoying the sun and some ice tea. Or perhaps something a little stronger. One of the cool things about Kodachrome film is that it made colors look a lot more rich. The house, the awnings and the grass are all proof of this. Vintage Photo from 1958 of a pink house with two bathing beauties in front of it. Does anyone know what “Southern Cross” refers too in this context? The only reference I can find is to the constellation, and a song from 1982 by Crosby, Stills and Nash.